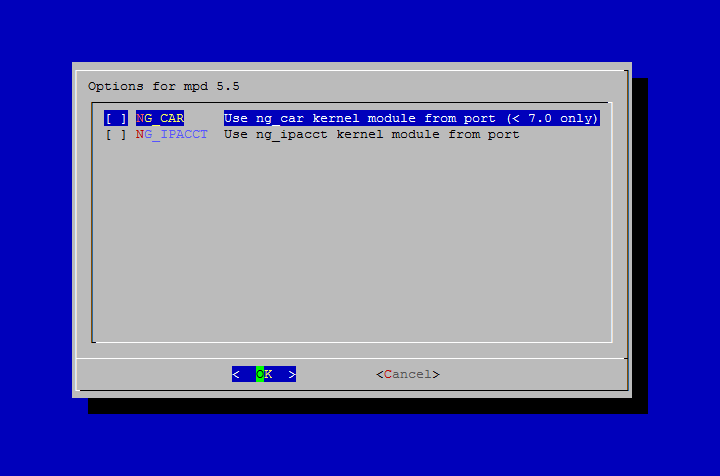 In this document we will be installing Mpd using the FreeBSD Ports Collection. So first make sure that your ports tree is updated and then proceed with the installation. After executing the above command you will see the following screen, allowing you to select different options. You can safely leave the options as they are and continue with the installation. Now that we have net/mpd5 installed, let's configure it. In this document we will only cover how to install and configure Mpd as PPTP server. Please also have a look at the online documentation of Mpd for more information on the different options of the mpd5 daemon. Mpd5 keeps it's configuration in /usr/local/etc/mpd5 directory. The main configuration file of Mpd5 is mpd.conf. Here is an example configuration mpd.conf file. set user <pptpadmin> admin - The administrator username for connecting to our mpd5(8) daemon. set ipcp ranges <mpd-ip-address>/<mask> ippool pool1 - Here we need to specify the IP address that our mpd5 daemon is listening on, along with the subnet mask for our network. set ipcp dns <dns-server> - In this setting we need to specify the DNS server IP address. If you have a firewall in front of your PPTP server, also make sure that your firewall is allowing traffic for the addresses in the assigned IP Pool. Now we can add user accounts that will be authorized to connect to our PPTP server. User accounts are stored in the /usr/local/etc/mpd5/mpd.secret file. The file contains username-passwords pairs that are used to authorize a user, separated by a whitespace. Then create the /var/log/mpd5.log file and reload syslog configuration. If you are running mpd5(8) in a firewalled environment, you will need to pass the traffic through your firewall, so that clients can connect to your PPTP server. And that's it, you should now have an installed and configured PPTP server. Now we can start our mpd5 daemon, so that our clients can connect to it. In order to view the already established PPTP connections through your browser, start up a browser to the mpd5 server on port 5006. In order to connect to this PPTP server, you need a PPTP client (included with any modern OS). If you are looking for a high anonymity VPN provider to allow you to surf in private and protect your online identity than you might want to take a look at SSLPrivateProxy.com. I've been using few VPNs from them for the last month and they've been working perfectly.